It’s a noun: “Change management is key to the project.” It’s a verb: “We really need to change manage that process.” It’s an adjective: “My change management skills are improving.” But what exactly is it? Change management is a structured approach for ensuring that changes are thoroughly and smoothly implemented, and that the lasting benefits of change are achieved. The focus is on the wider impacts of change, particularly on people and how they, as individuals and teams, move from the current situation to the new one. The change in question could range from a simple process change, to major changes in policy or strategy needed if the organization is to achieve its potential. Theories about how organizations change draw on many disciplines, from psychology and behavioral science, through to engineering and systems thinking. The underlying principle is that change does not happen in isolation – it impacts the whole organization (system) around it, and all the people touched by it. In order to manage change successfully, it is therefore necessary to attend to the wider impacts of the changes. As well as considering the tangible impacts of change, it’s important to consider the personal impact on those affected, and their journey towards working and behaving in new ways to support the change. The change curve is a useful model that describes the personal and organizational process of change in more detail. Change management is, therefore, a very broad field, and approaches to managing change vary widely, from organization to organization and from project to project. Many organizations and consultants subscribe to formal change management methodologies. These provide toolkits, checklists and outline plans of what needs to be done to manage changes successfully. When you are tasked with “managing change” (irrespective of whether or not you subscribe to a particular change management approach), the first question to consider is what change management actually means in your situation. 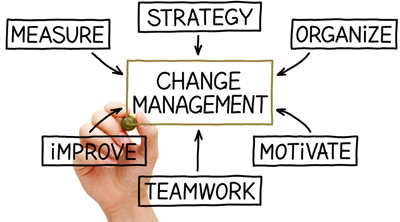 Change management focuses on people, and is about ensuring change is thoroughly, smoothly and lastingly implemented. And to know what that means exactly in your situation, you must dig down further to define your specific change management objectives. Communication: Telling everyone who’s affected about the changes. When you are defining your objectives and activities, it’s very important to coordinate closely with others: project managers, managers in the business, and the HR department. Ask “who’s responsible?” For example, who’s responsible for identifying change agents? Defining the re-training plan? Changing job descriptions and employment contracts? And so on. As every change is different, responsibilities will vary depending on how the change activities and project are organized. Only when you know who’s responsible and how things are organized in your situation will you know what’s within your scope, and how you’ll be working with other people to bring about the change. Once you have considered the change management objectives and scope, you’ll also need to consider the specific tasks. Again, the range of possible activities is broad. It’s a question of working out what will best help you meet the change challenge in hand, as you have defined it in your objectives and scope, and how to work along side other people’s and projects’ activities and responsibilities. The essence of this is to identify the tasks that are necessary if you’re going to give change the greatest chance of success. Identifying “change agents” and other people who need to be involved in specific change activities, such as design, testing, and problem solving, and who can then act as ambassadors for change. Assessing the impact of the changes on people and the organization’s structure.